The Plaza de Colón and Oficina de Turismo Colón are situated next to the Serrano, Goya and Jorge Juan streets, about a mile to the northeast of Puerta del Sol in the centre of the city. The plaza was originally called Plaza de Santiago, or St, James Square. In 1893 it was decided to rename the square to Plaza de Colón in honour of Chistopher Columbus. In Spain Chistopher Columbus is known as Cristóbal Colón. On the western corner of the square there is a tall monument built to the memory of Columbus. It was erected in 1885 to commemorate the forthcoming 400th anniversary of Columbus' voyage to the West Indies and features an ornamental square base with a long column above, on top of which is a statue of Christopher Columbus. The figure is standing, looking west with an outstretched pointing arm, showing the way to the New World of the Americas. On the eastern side of the square where Calle Serrano runs past there is another monument. This takes the shape of four huge concrete sculptures created by Joaquín Vaquero Turcios. These are of a much later date and they feature quotes and observations from famous philosophers and notable Spaniards. The sculptures dominate this side of the square, and actually have a kind of nautical feel to them when viewed from afar. The square features gardens, mainly on the north side, which are called, Jardines del Descubrimiento, meaning Gardens of Discovery. The Spanish Royal Mint stood here previously until 1970. 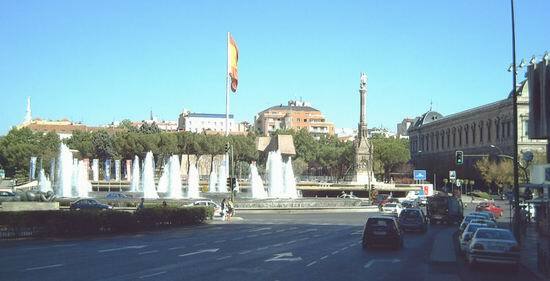 Below the column of Christopher Columbus is a fountain that cascades water. There are stairs at the end that take you down to the Oficina de Turismo Colón. The tourist office was designed by Portuguese architect, Alvaro Siza, who worked with Spaniards, Juan Miguel Hernandez de Leon and Carlos Riano. Below the Plaza de Colón there was an ancient subterranean passage. This has been transformed into a modern and spacious office where everything seems new. Once the destitute of Madrid curled up in cardboard boxes here, but now they are long gone. The fully transformed tourist office designed by Alvaro Siza also won the prestigious Pritzker Prize for architecture. Plaza de Colón also has the Teatro Fernán Gómez, Centro de Arte. The entrance leads down stairs below the Christopher Columbus statue. And Madrid's Hard Rock Cafe is located just off the square, on the opposite side of the Paseo de la Castellana avenu to the huge Torres de Colón towers. There are many first class hotels near this area, such as the the Petit Palace Art Gallery, which offers free laptop and wi-fi in every room. This is an excellent location, with good transport connections and a short distance from the city's major art museums. You can reach Plaza de Colón by Metro stations Colón or Serrano. Colón Metro is on the west side of the square, and Serrano Metro is at the northeast corner.